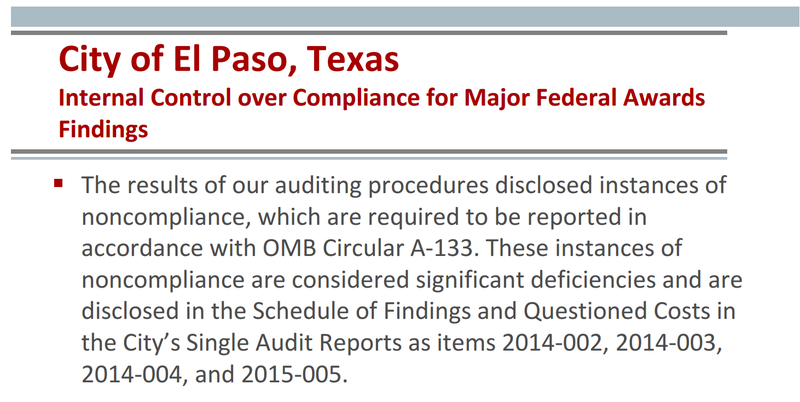 The auditor’s report criticized the city pretty strongly. Council needs to pay attention to this. The report did not say unimportant, or minor, or inconsequential. It said significant deficiencies. Alarm bells should be going off. This entry was posted on Wednesday, November 18th, 2015 at 4:56 AM and is filed under City government. You can follow any responses to this entry through the RSS 2.0 feed. You can leave a response, or trackback from your own site. Most of city council is NOT the solution but the problem. When are the taxpayers going to wise up and start getting rid of them and their lackeys in the city? We’re paying combined total compensation of about a million dollars a year for a city manager, a chief performance officer, and a CFO, and we still can’t balance our checkbook? Romero, Niland and others knew about this when the city manager received his big bonus. Now, Romero, Niland and Gonzalez also want to replace the city’s bond advisers, a relationship which has historically been ripe for corruption. They want the current adviser to take the fall for the cost of the ballpark. They want to terminate the contract early, which will likely result in the adviser filing a lawsuit against the city. The city can’t balance its checkbook, but it is becoming expert in litigation with vendors. One of the financial firms being considered is Estrada Hinojosa. One of Estrada Hinojosa’s executives is David Gonzalez. I wonder if he is related to our city manager. Alarm bells have been going off ever since they decided to tear down City Hall, but no one is listening. We are even worse off than we thought, ya know? It’s called lean six sigma and it’s worth $400 thousand. Right Tommy?